After nearly 10 years of service in the Gulf of Mexico’s Green Canyon region, Anadarko made the decision to recover components of the top tension riser system following the abandonment of two wells. The spar operates in approximately 5,000 feet of water. The recovery of this equipment gave Anadarko the opportunity to assess anticipated in-service wear that occurred on the top tension risers as well as estimate the remaining service life. Along with Vallourec providing 12 3/4” T95 pipe, the primary connector used was the VAM® TTR as the outer production riser, with the first production Top Tension riser being run in 2006 and 2007. As an outer production riser, the VAM® TTR is a threaded and coupled connection designed to withstand the critical concerns of top tension production riser systems directly in sea water — including fatigue due to waves, heave, Vortex Induced Vibration, surface and loop currents as well as water ingress to the threads causing corrosion. First designed and validated in 2004, the VAM® TTR incorporated these critical design requirements into fatigue enhanced threads, metal-to-metal internal and external seals, and special coupling features. Together Anadarko and Vallourec developed a plan to evaluate the condition of the removed pipe and connections for fatigue and corrosion following pulling. The inspection methods utilized included visual inspection, wet magnetic particle, and ultrasonic inspection of the pipe and connections. The Non-Destructive Evaluation (NDE) inspections showed the pipe and connection had performed very well in service, with very little signs of wear, excessive corrosion, or cracking in the deep-water environment. 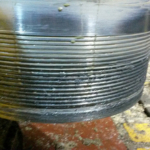 One of the specific areas examined was the external seal on the connection, which was designed to keep water from entering the threads and causing corrosion. Visual inspection of the connections during removal showed corrosion-free connections behind the external seal – as shown in above image. In addition to NDE, it was decided to re-evaluate the capability of the connection by testing as per ISO13679:2002 and fatigue testing. The connections were made up again to make testing samples and then tested for tension, compression, internal pressure, external pressure, bending capacity, and fatigue. The testing mirrored qualification testing performed prior to service in 2004. The ISO13679 tests successfully passed the evaluation, meeting all requirements of CALIII testing. Fatigue testing also performed well, showing excellent results and durability in both the pipe and connection. This premium connection is one of the first in the world to be retested after being exposed to extensive service in the Gulf of Mexico. The testing results provide a significant example of the robustness of Vallourec’s threaded and coupled Top Tension Riser systems. Reproduced courtesy of World Oil Magazine. Read the Constitution Truss Spar Post Removal Testing article online. Click to view the VAM® Riser brochure. 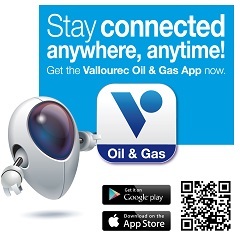 Contact us for Vallourec – North America OCTG, VAM® connections and services.